Oil prices are seeking higher ground this morning, looking ahead to a holiday week next week when volumes will be light. Oil markets gained back some of the losses they took earlier in the week, with markets up 85 cents (1.5%) after trading flat/slightly lower all day yesterday. Prices are back near the $56 level and are currently trading at $55.99. Refined product markets are following crude markets higher, though lagging behind crude’s growth on a percentage basis. Diesel prices are trading at $1.9193 this morning, a gain of 1.7 cents (0.9%) after small losses yesterday. Gasoline saw some larger losses yesterday, 1.87 cents compared to diesel’s loss of just .62 cents. Gasoline gains are still lagging behind diesel today, with gasoline picking up just 1.1 cents (0.7%) to trade at $1.7249. A portion of the Keystone Pipeline was shut down after a leak in South Dakota, cutting off flows from Alberta to Cushing, OK and to Patoka, IL, though the line to the Gulf Coast remains operational. The 5,000 barrel leak came just days before a vote on Keystone XL, an additional line that would increase the flow of oil from Canada. The outage could be giving the market a boost, since the line outage is trapping crude in Canada until the leak is fixed. On the OPEC front, markets are growing more and more anxious over whether a production cut will occur. Saudi oil ministers are unanimously supporting an extension through the end of 2018, but Russia, the largest non-OPEC signatory of the deal, is sending mixed messages. A while back, Russian Prime Minister Vladimir Putin gave his support to a deal extension, but oil officials in the country are more skeptical and worry that continued volume reductions could prove bad for business. 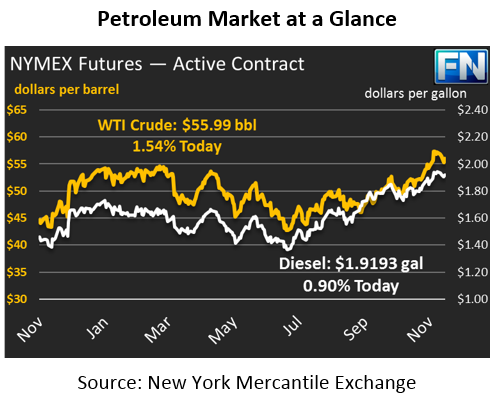 With the November 30 meeting approaching and a holiday week causing light trades next week, traders appear to be jumping into the market well before the OPEC meeting to give time to benefit from the price boost if OPEC agrees to cuts.